Where the Pyro Pros in Pennsylvania Go! Whether you are a pyrotechnic professional or a backyard blaster, you know that the right pyro supplies make or break your fireworks display. 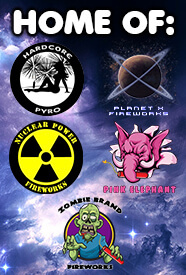 That’s why we sell the highest quality pyro gear at the best prices in the universe. It’s also why we offer expert pyrotechnic and safety advice free of charge. Just call us or come by!